I've got a Cherry MX 5000 that I've been using since 1996, and it now stopped working after I removed the keycaps for a bit of cleaning . I initially though that a key must've got stuck, but when I disconnected the whole keyboard from the controller PCB the problem persisted. Symptom: When I use keyboardchecker.com (I didn't find a specific software for the mac), "home", "end", "page down", "arrow up" and "0" show as depressed (not released). Again, this is with only the controller PCB with no keys connected at all. (When the keys are connected, it will behave in the same way, and the modifier keys seem to still work - all other keys don't). I also replaced my PS/2-USB dongle as I though this may be the culprit - no change. Has anyone an idea how I may go about to fix this? The controller board does not seem overly complicated, but I have no schematics or any information about it. I tried my luck in replacing the larger capcitors. When I pulled C1, the board doesn't act up, but when I replace it (even with a new one) the problem resumes. The IC on the board is a Motorola ZC86963P. I found no information on that one other than that it appears out of production and could probably be obtained from a "speciality" dealer. I fear that if I go to a "normal" repair shop, they won't probably get very far. If you pulled a capacitor and everything worked fine, then I would just leave it yanked and call it a day. Or go and reflow all the solder joints on the board, put in your replacement cap and see if that fixes it before anything gets more involved. That's pretty much the old "Did you try turning it on and off" of small simple board repair. If you take some pictures of the board internals, top and bottom we should be able to get the basics figured out even without schematics though. Unfortunately pulling the capacitor only stopped the erroneous "keypress", but also stopped the keyboard from working. Here are pics of the board, I marked the missing caps. Your diode in the D6 slot needs to be soldered back in too. Hi, sorry I didn't have that much time for explaining. I unsoldered the diode too, for testing. What confuses we is that it does something event though the keys are all disconnected. I have a multimeter but little idea of which voltage should be at which point. Well, the main chip is getting power and talking to the computer just fine. The stuff you pulled is powering the shift register for columns I think? Can't tell with the passthroughs under the chip. 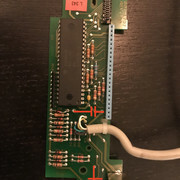 What I would do is put all the parts back in, reflow the stuff listed here, the connects and the passthroughs between the columns and the chip to make sure every connection is good. Then also make sure the passthroughs topside are clean and isolated from one-another. Some of those traces look like the varnish is stripped off the copper. If they're shorting to something, that could be messing stuff up. If none of that works, then your shift register is probably toast. You can try to replace it or even just cannibalize the connectors off the board and replace the controller entirely with a modern Teensy 2.0++ clone for $15 and convert it to fully-programmable USB with modern layers and macros and all the fixin's. Doh, yeah, it's a resistor array. That's what I get for posting as soon as I got up before coffee. You can double-check it with your meter in ohm mode between the pins just to be sure it's all good. The main thing is there's some commonality between the keys being shown as pressed and the sense bit. Find the column/row on the board that connects all the offending keys. 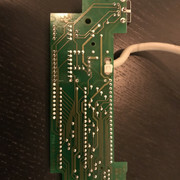 Find what trace it connects to on the controller. 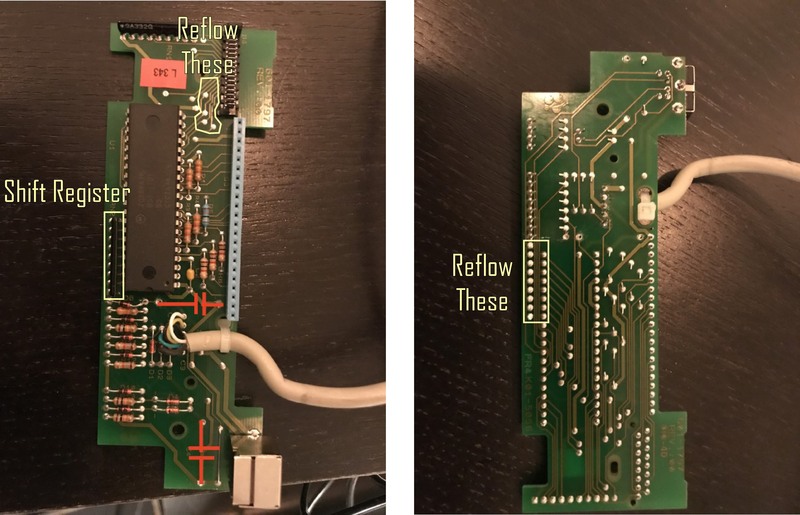 Reflow every component in that line from the connector pin to the motorolla chip. If that doesn't work then start pulling components in that exact line (the diodes and resistors) and test those. You should be able to read the expected resistor values off the bands and if the diodes are bad, they'll likely just be shorted but you can look up their numbers for their exact voltage values if you want too.